Eighteen high school students are attending the Minority Youth Science Academy (MYSA) at Samford University June 26–29. The residential program, launched in 2014, offers college preparation and mentoring for outstanding minority high school students who aspire to careers in science, technology, engineering and mathematics (STEM) fields. This year’s MYSA activities include creek exploration, introduction to “fur, feathers and scales,” astronomy and rocket building. Participants also will benefit from panels of minority professionals and students, ACT preparation tips and a networking dinner. MYSA arose from conversations between biology professor Drew Hattaway and chemistry professor Denise Gregory, who also serves as Samford’s Director of Diversity and Intercultural Initiatives. 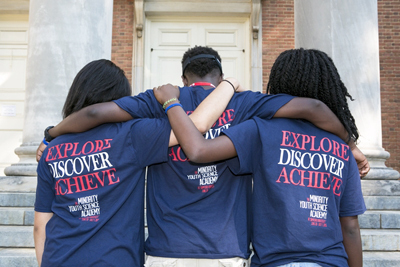 The separate questions they considered — how to emphasize the college’s STEM programs, how to attract new students and how to increase diversity at Samford — converged in a single idea for the new summer program. Gregory and Hattaway designed MYSA to give participants taste of college STEM work, help them navigate the world of college admission and scholarships, and learn from minority STEM professionals. The program also addresses the decline of STEM graduates nationally and the historical underrepresentation of minorities in STEM fields. Individual donors continue to sponsor MYSA scholarships, and this year the program also received a contribution of $5,000 from the Birmingham chapter of Jack and Jill of America. The chapter dedicates its resources to improving the quality of life for children, particularly African-American children.